The unique design of the combination synthetic and natural fibers enhance the flow of palleted paints with great control and length of line. 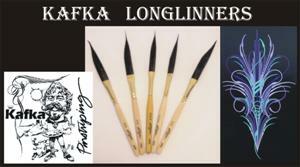 A must see is the Kafka dvd to showcase how to create magnificent scrolls and easy flame layouts. 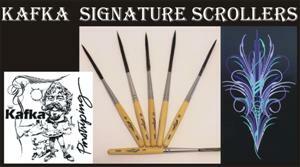 Pinstriping brushes cannot do this kind of scrolling. The Longliner is a personal favorite of Steve's considering that he is not known for his straight line work. with longer than normal hairs you may pull a line much further with the extra paint load.